Grand Canyon National Park- The next morning we got up early and drove the 2 hours to the Grand Canyon North Rim. The drive through Zion leaving the park was amazing. Tunnels, mountains and beautiful views were around every corner. We were extremely lucky that there was a frontier cabin available at the Grand Canyon Lodge when I booked a couple days before. We suspected that due to the extreme heat they had some cancellations. If you go remember to book early. The window to book opens 12 months in advance. We arrived around 11am and our cabin was already available. Score! The cabin had a twin and full size beds with a small bathroom over looking the Grand Canyon. At $150 a night it was perfect except that it didn’t have air conditioning. At the registration desk at Grand Canyon Lodge. We arrived early and our room was ready. Score! The first thing we did was to explore the Grand Canyon Lodge and the view. While wandering around we also found that we already hiked out to Bright Angel. We found this hike extremely easy paved trail so much so we didn’t think we hiked it. Bright Angel trail is a easy hike with great views. Then we got back in our car and drove out to Cape Royal and the Walhalla Overlook. On our way back we stopped and hiked a portion of the North Kaibab Trail. Mr. Travelmista wants to do the Rim to Rim hike so he wanted to see how hard the Kaibab trail was to hike. Then we headed back to the Grand Canyon Lodge for dinner. We didn’t have dinner reservations but you never get anything unless you ask for it so we arrived early for dinner and politely asked if they possibly had any tables available. And guess what they had one. We had dinner which the service was very quick which was a plus but food costs were expensive. The table we got had no view of the canyon but architecture of the Grand Canyon dining room was impressive. After diner we headed outside to watch the sunset over the Canyon. Everyone gathers to drink wine an socialize as they kiss the sun goodnight. The atmosphere and comradery with people from all over the world is the best thing about visiting national parks. 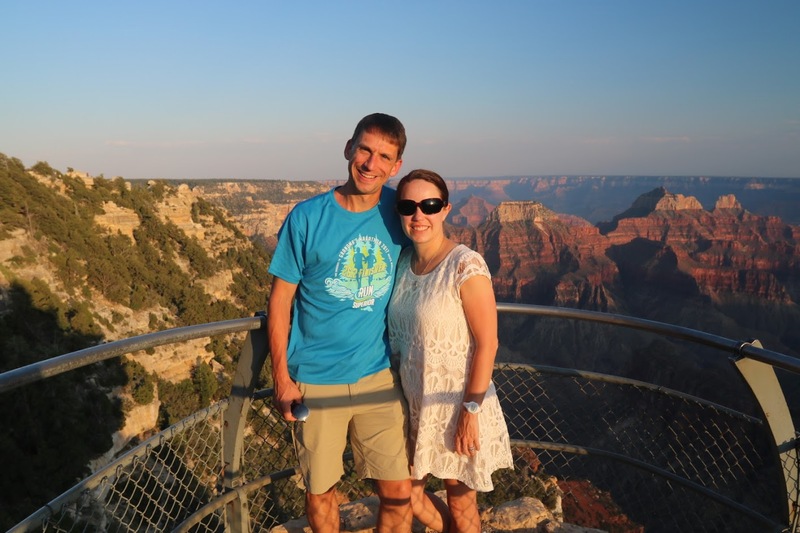 The Grand Canyon Lodge was a great experience and we highly recommend getting reservations. Just note there is no cell service unless you were overlooking the canyon and only in a couple of spots. We were able to place a couple of Facetime calls back to our family so they could see the Grand Canyon but don’t expect your cell service to work. The next morning we woke up early and hiked back out to Bright Angel to watch the sunrise over the canyon. It was quiet and beautiful with few people. Highly recommend waking up early. We then showered and headed out for our next destination in the loop- Antelope Canyon. Stay tuned!